Its major export partners are Italy, Germany, and Turkey. Its main exports are food and beverages, as well as a manufactured goods. Its major import partners are Germany, Italy, and Russia. Its major imports include machinery, transport equipment, and fuels. Located in Southern Europe, Greece has a 1,110.00 km border with Albania (212 km), Bulgaria (472 km), Macedonia (234 km) and Turkey (192 km). It has a 13,676.00 km coastline. Greece and Turkey continue discussions to resolve their complex maritime, air, territorial, and boundary disputes. The capital city of Greece is Athens. With a history that dates back over 3,000 years, it is the oldest city in Europe that is still inhabited. Located on the peninsula of Attica, on the South Eastern Coast of Greece, it is surrounded by mountains on all sides. King Otto chose it as the capital in 1834 with the thinking that, after its near destruction during the Greek War of Independence and its heritage as the center of the ancient Greek civilization, it would be rebuilt to reflect both Ancient and Modern Greece. The Acropolis, which has well-preserved monuments that were built in the 6th Century and the Monasteries of Daphni are both UNESCO World Heritage Sites. Together with Athens’ many other archeological sites, museums, tours and vibrant culture, they make Athens a popular tourist destination. The city has long, dry and hot summers followed by mild to cool winters with modest rainfall. 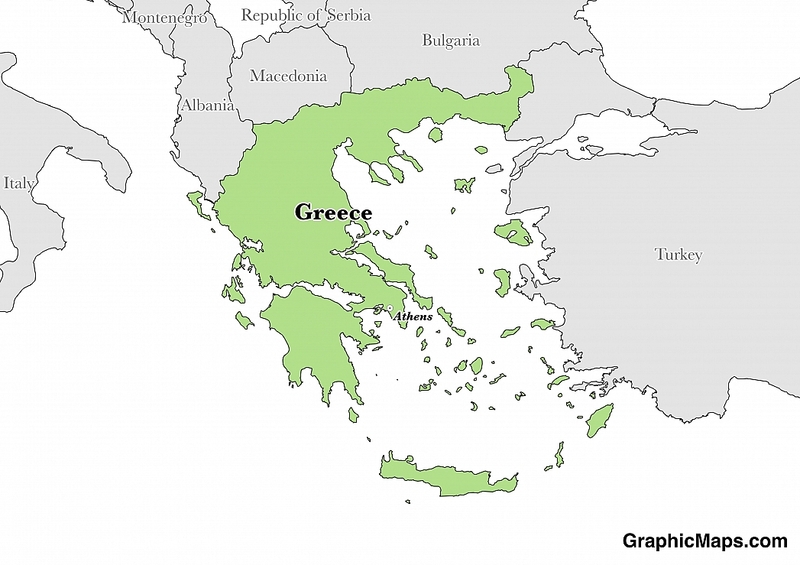 Greece is a European country covering 131,957.00 km2 of which 0.99% is water and 130,647.00 km2 is land. This makes it the 95th largest country in the world and slightly smaller than Alabama. Its geographic coordinates are 39 00 N, 22 00 E and Athens is the capital city. The English name "Greece" comes from the Roman "Graecia", which means "Land of the Greeks". Its ISO code is GR. Greece has a mean elevation of 498 m above sea level. It has a temperate climate with mild, wet winters and hot, dry summers. Its terrain is mainly mountainous. Greece has a population of 10,773,253 making it the 84th largest in the world. One-third of the country's population lives in and around Athens. Greek is the official language. The major ethnic group reported is Greek. The majority of the country identifies as Greek Orthodox, the majority state religion. The dialing code for the country is 30. Greece is an independent country. It gained independence from the Ottoman Empire in 1830. Its constitution was last ratified in 1975. The Government of Greece is a parliamentary republic. The seat of the Prime Minister is at Herodes Atticus Street 19 in Athens. It is close to the Presidential Mansion, the official residence of the President. The politics of Greece are unique since the people vote in 300 parliamentary deputies and the party leader automatically becomes the Prime Minister. Besides, the people do not choose the president - instead, the parliamentary deputies appoint them. Factoring in Purchasing Power Parity, Greece's GDP is $291,000,000,000.00 (USD) with $26,800.00 (USD) per capita. This makes it the 57th largest economy and its citizens the 68th richest in the world. The currency of Greece is the Euro (EUR). Its major export partners are Italy, Germany, and Turkey. Its main exports are food and beverages, as well as a manufactured goods. Its major import partners are Germany, Italy, and Russia. Its major imports include machinery, transport equipment, and fuels. 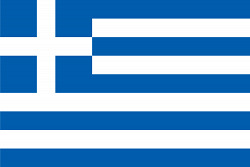 The “Blue and White”, which the Greek national flag is sometimes called, has nine alternating blue and white stripes of equal width that run horizontally. There is also a blue square on the upper left corner with a white cross within. Before its official adoption in 1978, it used to be the naval ensign. Previous versions of the flag had either a crown or a coat of arms at the center of the cross depending on the government of the time. The shade of blue varies from dark to light as there is no official specification. The blue and white are considered to symbolize the sky and the sea surrounding the country. The meaning behind the nine stripes is believed to either stand for the nine letters in the Greek word for freedom or the syllables in the Greek expression which means “Freedom or Death."